Drawing from a brochure published by the Centralverein in 1932. It calls to fight anti-Semitic slogans such as “ritual murder”, “Jewish internationalism”, “Jewish Marxism”, and “Jewish race”. 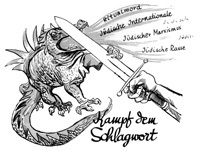 The Centralverein deutscher Staatsbürger jüdischen Glaubens [Central union of German citizens of Jewish religion] was founded in 1893, with the aim of fighting the rising anti-Semitism in Wilhelmine Germany. Anti-Semitism did not disappear after German Jews had been granted legal equality. In the late 19th and early 20th century, it remained constantly present, not least in academic milieus. Jewish mathematicians felt the brunt of anti-Semitism most bitterly whenever they applied for higher appointments and positions. The Prussian Ministry of Culture, which appointed all professors at Prussian universities, either ignored suggestions of appointments of Jewish professors, or rejected them as candidates without giving a reason. After 30 January 1933, anti-Semitism gradually became the law of the land. The dramatic development from anti-Semitic stereotypes to the Nazi obsession with race can also be traced in mathematical culture – in documents, texts and actions, and not least of all in pamphlets published by adherents of the so-called “Deutsche Mathematik”. Ludwig Bieberbach, a Berlin professor and an acknowledged expert on function theory, published racist articles on “Styles of mathematical work” and “The racial roots of science.” He did not hesitate to denounce colleagues (e.g. Issai Schur) and students. In 1937, as Dean of the Faculty for Mathematics and Natural Sciences, Bieberbach attempted to prevent the doctoral student Gabriele Neuhäuser from completing her doctoral thesis by informing on her to the Gestapo.